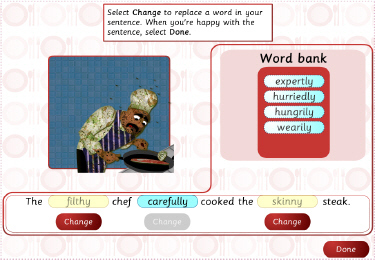 Add descriptive words to two simple sentences about a chef and a lady in a restaurant to make the sentences more interesting. Experiment by substituting different descriptive words in each sentence. Notice the impact of your word choices on the accompanying animation for each sentence. Use your two lively sentences as the start and ending of an imaginative story. Check your word choices to see if the story could flow better. Then complete the following extension activities: describe a dinner-related image; use a new set of words to create another vivid sentence; extend your story about the meal. This learning object is one in a series of four objects. Due to the use of rich media content, this learning object is suitable for a connection speed of 256 kbit/s or faster. © Education Services Australia Ltd, 2016, except where indicated under Acknowledgements. Unless otherwise indicated, this material may be used in accordance with the Creative Commons Attribution 4.0 International (CC BY 4.0) licence creativecommons.org/licenses/by/4.0/.